A modern car is far more than an assemblage of components. To achieve the levels of speed, comfort, handling, economy and safety required, each component will have had its design refined multiple times. The way they eventually work together as systems and sub-systems is indicative of layer upon layer of careful optimisation. This same dedication to technical processes can be applied to hydraulics systems. Hydraulic engineers have been using computers for many years. 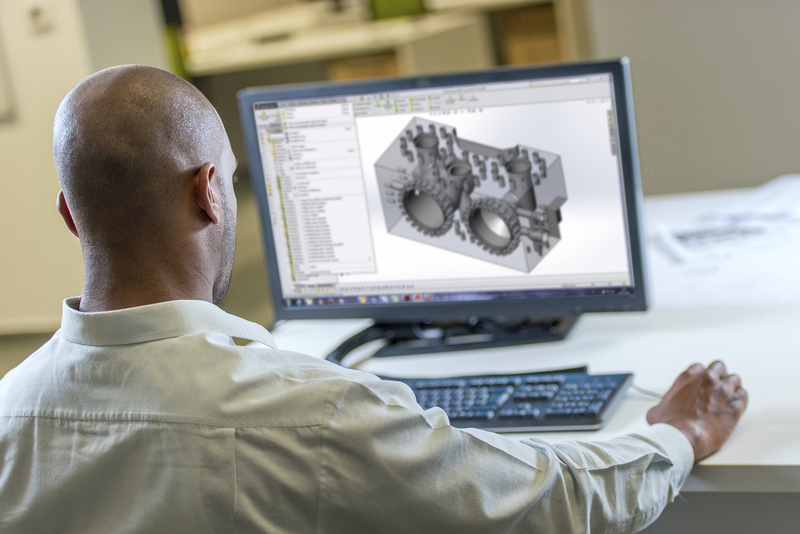 Starting with 2D CAD (computer aided design) and moving through 3D CAD to modelling, simulation and using techniques such as finite element analysis (FEA) and computational fluid dynamics (CFD), the industry today is in a position where computer aided engineering (CAE) is an established and sophisticated discipline. Hydraulic companies have been developing their own proprietary computer systems for many years and also use software packages such as SimulationX, an incredibly powerful tool which integrates the designing of the hydraulic, mechanical and electrical systems used in complex projects such as subsea drilling, aerospace and locomotive design. The most advanced hydraulic companies use computer-based techniques at every stage of research, design, development and systems integration. When designing individual valves, actuators and manifolds they use component design tools such as CAD and CFD, run software simulations and refine the design with FEA. Moving onto systems design, today only the very simplest of systems would not be simulated in software as a first step. The hydraulics industry has developed its simulations abilities to the highest levels, even developing specialist software for particular applications. Advanced CAE can seem almost magically powerful, but in reality it is based on standard engineering processes coupled with a computer’s ability to retain and use enormous amounts of technical data (unlike the human mind, which tends to overlook details in favour of overall ideas). For instance, some computer produced models are created by breaking the desired system down into linked sub-systems. The sub-systems are based on preconfigured elements such as pumps, actuators, motors and valves selected from libraries in the memory. By running the models the dynamic behaviour of the proposed system under various conditions can be predicted, assessed and optimised. While SimulationX is popular for hydraulic systems design, it has also been used in other fields such as automotive, shipbuilding, mining, power generation, aerospace, heavy machinery and medical devices. The advantages of software simulation can be summed up as being fast yet thorough, allowing compression of the time required to fully engineer complex systems. In a little more detail, we can say it will test and prove a system’s, or machine’s, operational capabilities in terms of productivity, whole-life costs and safety. It can predict wear and maintenance requirements and how the system will behave in extreme circumstances. It can also highlight ways to improve performance and efficiency and compare alternative design ideas. Ultimately it allows a system’s design and development to proceed quickly and efficiently based on proven data rather than trial and error. Oilgear has used computer modelling techniques on countless occasions and has achieved many notable firsts, including: systems that predict and adjust for movements at subsea wellheads; development of PLC control systems for synchronising the drive of paired shipboard reel drives; verifying the design and performance of seabed riser tensioning systems including modelling of worst-case heave scenarios; and modelling water hammer and pressure wave effects. Oilgear has also used simulation technology to build models of existing systems, so that their performance can be accurately analysed and optimised. This can lead to significant extensions to the working life of installed systems. Taking this further, Oilgear has a multi-disciplined team across their worldwide location that holds regular technology forums for the purpose of information exchange. This information is used, together with computing power, to improve product and systems designs through root cause analysis, flow force reduction studies and dynamic simulations. These are cutting edge computational processes that are helping push the boundaries of hydraulic performance to ever-higher levels. Jim Cairney is Engineering Manager of hydraulics company Oilgear UK.